"As you get older, your skin gets thinner. After researching skin salons and consumers and learning that rich creams, oils or elastin and collagen weren’t answering the problem, Reviva Labs did extensive testing and made an interesting discovery. We discovered that, over the years, skin loses Essential Fatty Acids – essential elements for the fullness you see in youthful skin. Omega-3 and Omega-6 fatty acids lost in skin cell membranes results in skin becoming dry and thin. Diet-wise, the Omega EFA’s help, but they’re utilized primarily for body organs; not skin. And Omega-3 and Omega-6 from plant sources is a major deficiency. So Reviva presents a first in skin’s external need for already thin skin, or as a preventative cream you alternate in your current skin regimen (2-3 times weekly, for example, or over an anti-aging gel or serum). Of course, for already thin, delicate even paper-thin skin, daily usage on face, hands and arms can make a dramatic difference you’ll see quickly. It’s Reviva Labs Nourishing Cream – for fuller, smoother, more supple skin!" I am in love with this nourishing cream! I used it twice a day, didn't have any irritation or dry skin from it, and it worked wonders. My skin appeared more supple and nourished, healthier & vibrant. The tone of my skin seemed to even out, and my face just had a nice healthy glow to it. I also tried their DMA Firming Fluid. I used it on my neck, because that is the area I feel needs the most firming. 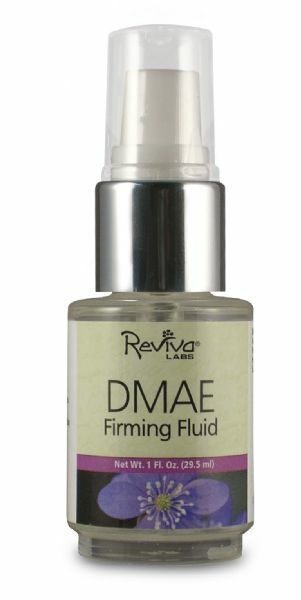 "Use alone or under anti-aging creams, this potent, concentrated DMAE formula has particular benefits for the throat area. It helps firm loose muscle tone, but can also improve firmness and tone on any facial area!" I'm really happy with the results I saw with this Firming Fluid. Once again, no irritation or drying, and it worked great. Easy to apply, perfect for specific areas, not too runny either! My neck appears firmer, where as before I noticed I had a little saggy skin under my chin area.